The Originals Season 1 Episode 18 gave us another New Orleans street party, the Fete de Benedictions, a ceremony where gifts are given to the witches in exchange for their blessings. But as you've probably figured out by now, no New Orleans party is complete without a few surprises. Genevieve, as a show of good faith in the terms of their treaty, asks Elijah to host the Fete de Benedictions so that the witches of the French Quarter can show that they've accepted their new role in the society. He agrees, seeing it as a good PR move, inviting representatives from the human and werewolf factions. And it IS a good PR move. Until it isn't. 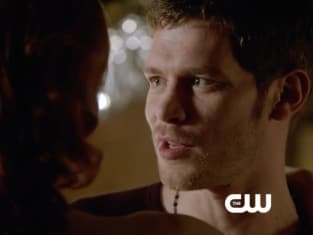 First, Klaus angers Genevieve by giving Davina a gift after Genevieve and Monique decide to teach Davina a lesson about family and loyalty to her coven. They allow no one to give her gifts, which means she's not allowed to give any blessings. 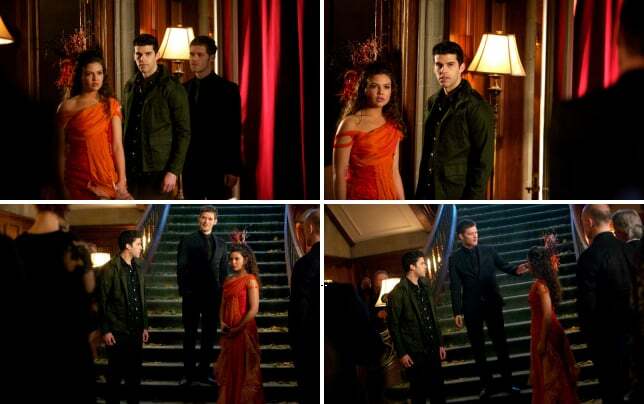 When Josh arrives, Klaus gives Davina the gift of Josh's freedom and the spell to create daylight rings. Either he's trying to get her on his good side or he's just unknowingly given her the thing that could bring about his undoing. Marcel is amassing an army and without a witch at his side, he's bound by the sun. Now that Josh is free and working with Marcel, might Davina make a move back to his team? It's possible. During the party, Marcel and Thierry stage an attack by sending in a band, having them slit their own wrists, and then flipping off the lights in the room causing every vampire at the party to lunge for the flowing blood. When the lights are back on, a pile of bodies is left on the floor and the words "there will be no peace" are scrawled on the wall. Elijah has a rebellion on his hands, which he attempts to squash by ripping out Thierry's heart while Marcel watches. That probably wasn't Elijah's best move. His best move was telling Klaus that under no circumstances will he continue to restrain himself when it comes to his feelings for Hayley. Elijah is fed up, completely, with constantly being the one to seek Klaus' redemption. It's clear to Elijah that Klaus doesn't want to be redeemed, that he will always have his own best interests at heart and will always be seeking a way to best his opponents, even if that opponent is his own brother. Klaus trusts no one. Finally, no one trusts Klaus. Now that Elijah is giving himself the freedom to pursue Hayley, we might actually get some Haylijah scenes we can sink our teeth into as long as Jackson doesn't get in the way. But that seems quite likely. A love triangle between Elijah, Hayley, and Jackson. Both men represent love and family since she is uniquely tied to both of them. The best scene of the night goes to Elijah in the woods telling Hayley's packmate that all he wants is her happiness. While he would love to be involved with her, has been denying himself for Klaus, he would gladly continue to deny his own desires if that would make Hayley happy. Elijah is the birth mother in the parable about King Solomon. He would see Hayley with another man than risk hurting her. The runner-up for best scene is a tie. Cami, knowing there's a good chance that neither Klaus nor Marcel will be able to come through for her, goes directly to Genevieve to ask for help lifting the hex. Genevieve told Klaus she couldn't do it without Esther's grimoire, but when Cami hands her the gift, she softens and seems willing to help. That is, until Klaus goes and ruins it. He hands Genevieve a box which contains the hands of the witch she sent to steal the grimoire and really, really angers the one witch in New Orleans who might be able to help them right now. Nice! The good news, if there is anything good about this, is that Klaus knows he screwed up by angering Genevieve and goes to Cami to apologize for the fact that he got in Kieran's way. What makes that a good scene is that he doesn't seem to know that he got in Cami's way until it's too late and he apologizes anyway. He could've just said "to hell with it" and gone to his room. He's not happy that Cami slept with Marcel, though, and vows that the next time he sees Marcel, his protege, the man he loved like a son, he'll kill him. Marcel doesn't plan to go down without a fight. Neither do the witches who, instead of wanting Genevieve dead to complete the Reaping, now want Hayley's baby. What did you think of The Originals Season 1 Episode 18? Should Hayley choose the vampires or the werewolves? Were you shocked that Elijah killed Thierry? Were you shocked that Klaus pardoned Josh instead of killing him? Yes! I thought he might actually kill Josh!! No! Josh and Davina are like peas and carrots! They work well together! Josh, who? Here is your first look at The Originals Season 1 Episode 19, "An Unblinking Death."